Montessori Teacher: What Traits Does It Take To Be One? 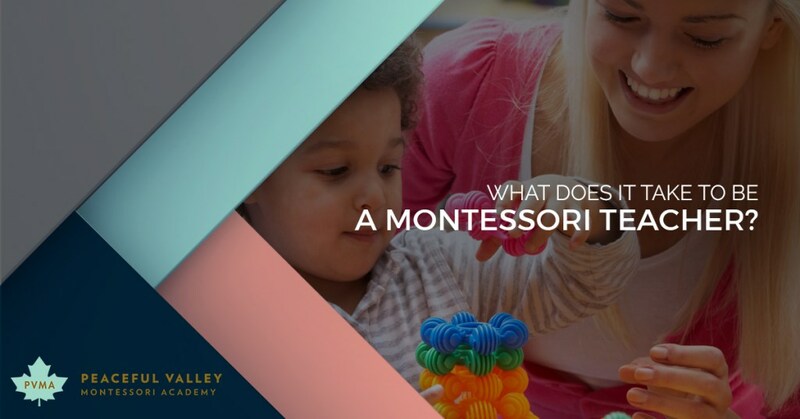 “What does it take to be a Montessori teacher?” When you take a look at the title of this blog, it can certainly be read in two very specific ways. First, a person could read it in the technical way: what legal requirements must be satisfied in order to become a Montessori educator? What type of education do they need, and what certifications are necessary? This more technical approach to the question is difficult to answer, because it depends on which state they’re in (or which country), why type of position they’re going for, and what grade levels they’re certified to teach. Teaching Montessori for toddlers is certainly different from teaching it to high-schoolers. Is there any more generic phrase to find on a résumé than “attention to detail”? This phrase tries to be all-encompassing, whether a person is applying for a position as an editor, police officer, or air traffic controller! Sure, “attention to detail” is important to those positions, but isn’t it important in absolutely every job in existence? Every job requires the person to attend to details and perform the job properly; otherwise, out they go! So when it comes to Montessori education, teachers certainly do need great attention to detail. The need to observe the details in a classroom — how a child is interacting with others, how they’re interacting with the environment — and discover the best way to help a child discover his or her best learning style. As we’ve mentioned before, there are as many ways to teach children as there are children. Montessori training gives teachers a good basis of how to guide children through the careful observation we talked about above. But that doesn’t mean that there’s a direct answer in the training materials for every child. Every child is unique, which means new and creative ways have to be made up on the fly to make the most of each child’s educational day. This is is a must with any early education teacher, of course. A teacher should be able to work with kids, communicate with them well, and have a genuine interest in helping kids get the most out of their education. But when it comes to Montessori education, a teacher has to be even better with kids. While a public school teacher can rely on the standard curriculum and guide kids toward necessary testing, a Montessori teacher has to be able to properly communicate with children in order to draw out their best. As adults, we like to have the answer. Does the boss need something? We want to impress them. Is the spouse angry about something? We want to be able to placate them. So when it comes to questions raised by kids, we’re often in the position of providing the answer…but we shouldn’t always answer directly. One of the toughest parts of being a Montessori teacher is letting the kids do the work on their own. It’s important to wind their minds up and let them go to discover the best learning style for them. Montessori teachers need to be able to communicate well with the children and then link them to the learning materials, only stepping in when necessary. Mistakes will be made. Children need to learn that it’s perfectly normal to make mistakes (especially when they’ve participated in self-directed learning), and that it’s not the end of the world when mistakes happen. Of course, sometimes it does seem like the end of the world, and a good Montessori teacher will be able to walk them through the mistake and get them back up on their feet. Without a doubt, Montessori schools are a bit more active than traditional ones. In most public schools, teachers are most interested in quiet students who pay attention to the front of the classroom at all times. That’s certainly not going to be the case with Montessori classrooms, and a good teacher is willing to give up a bit of control to facilitate kid’s learning styles. Montessori teachers are special people who not only have a love for teaching children, but also have the strong desire to see children learn on their own. They’re amazing facilitators who are always looking for ways to open children’s minds. If you’d like to meet our teachers, contact Peaceful Valley Montessori Academy today!